October was quite a month for playing lottery games. There were the $1.6 billion Mega Millions and $687 million Powerball jackpots that fueled lottery mania across the nation and Connecticut. The state of Connecticut kept $14.7 million of that amount for its General Fund. Last month, a Redding man claimed a $1 million Powerball jackpot from a ticket sold in Wilton. Charles Dudley claimed the jackpot just 23 days before it was scheduled to expire. Months after the May 2 drawing, Dudley was cleaning out his wallet and came across the Powerball ticket, stuck between a number of old receipts. “I checked the winning numbers on the Lottery's website and couldn't believe it. I checked it over and over. The numbers were a match. It didn't feel real, though, until I checked the location of where the ticket was sold. It was where I bought my ticket,” he told Lottery officials. Gerald Isaac, of Monroe, cashed in the second largest prize last month. He won $500,000 on a Play 4 ticket sold at Shell station, food mart and car wash in Trumbull. 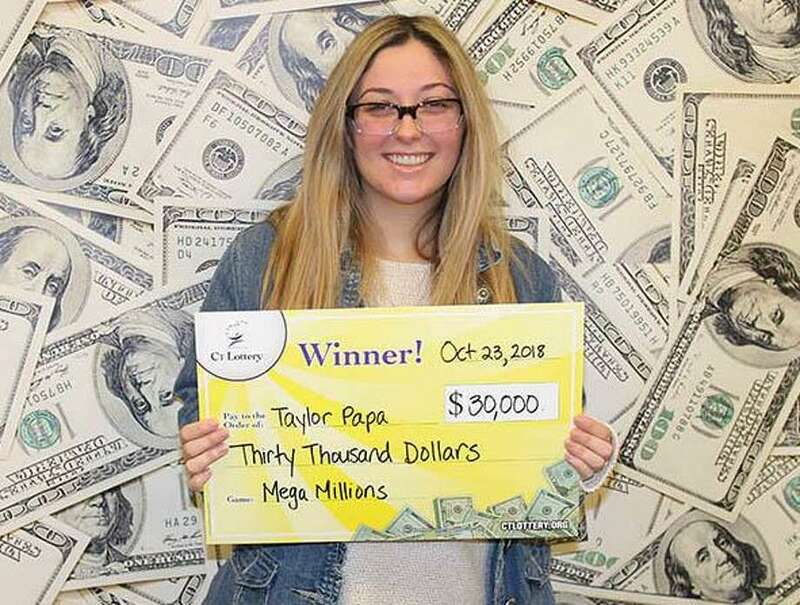 A 22-year-old waitress from North Haven won $30,000 on a Mega Millions ticket. Jesus Linares, of Norwalk; $30,000 on a 3X The Cash ticket sold at Cibao Deli & Grocery in Norwalk. Domingo Gonzalez, of Fairfield; $20,000 on a 20X Cash ticket sold at Merrit Country Store in Westport. Michael Brigante, of Norwalk; $100,000 on a Cash 5 ticket sold at Pressure Discount Tobacco in Norwalk. Zubair Rashid, of Waterbury; $30,000 on a 30X Cash ticket sold at Citgo in Danbury. David Pineault, of Danbury; $10,000 on a 30X Cash ticket sold at All Star Gas in Danbury. James Carbone, of Bridgeport; $100,000 on a Cash 5 ticket sold at Stop & Shop in Fairfield. Pamela Donnelly, of Milford; $25,000 on a $250,000 Cashword ticket sold at New Town Market in Milford. Guiselle Elizondo, of Sherman; $30,000 on a 30X Cash ticket sold at Hit and Run in New Milford. Ruth Ridgeway, of Danbury; $50,000 on a $5,000,000 Ultimate ticket sold at Bank Street Exxon in Waterbury. William Elmore, of Bridgeport; $30,000 on a 30X Cash ticket sold at Wheels in Bridgeport. Christopher Oliva Foronda, of Stratford; $10,000 on a Play 4 ticket sold at Checkers Food Store in Stratford. Rolando Zotelo, of Norwalk; $35,000 on a Play 4 ticket sold at Pressure Discount Tobacco in Norwalk. Charles Speriglio, of Stamford; $30,000 on a 30X Cash ticket sold at Cedar Corners Store in Stamford. Matthew Grey, of Cheshire; $100,000 on a $500,000 Extreme ticket sold at V Mart in Prospect. Nestor Nkwo, of Bridgeport; $10,000 on a 30X Cash ticket sold at E&M Park Fuels in Bridgeport. Michael Burnell Jr., of Middletown; $10,000 on a 10X Cash ticket sold at Cumberland Farms in Portland. Demica Hicks, of Ansonia; $10,000 on a 10X Cash ticket sold at Cumberland Farms in Ansonia. Freddy Orlando and Zambrano Castillo, of Bridgeport; $50,000 on a Play 4 ticket sold at Compare Food in Bridgeport. Patricia Puente Teran, of Bridgeport; $50,000 on a Play 4 ticket sold at Compare Food in Bridgeport. Douglas Pugh, of West Haven; $25,000 on a Wild Cash ticket sold at Power Gas Food Mart in New Haven. Patrick Lynch, of Ansonia; $10,000 on a $5,000,000 Ultimate ticket sold at Ansonia Xpressmart in Ansonia. Louis Marrone, of Bridgeport; $10,000 on a 10X Cash ticket sold at City Gas Food Mart in Bridgeport. Robert Kean Jr, of Beacon Falls; $10,000 on a $100,000 Cashword ticket sold at Beacon Falls Xpressmart in Beacon Falls. Peter Papadopoulos, of East Haven; $10,800 on a Keno ticket sold at Allegras Cafe in Branford. Edward Mattice Jr. of Wallingford; $25,000 on a $250,000 Cashword ticket sold at Oakdale Citgo in Wallingford. Marcos Melendez, of Stamford; $25,000 on a $500,000 Extreme Cash ticket sold at Absorb Discount Liquor in Bridgeport. Cheryl Middagh, of North Haven; $100,000 on a Cash 5 ticket sold at Krauszer's Food Store in North Haven. David Istvan, of Derby; $10,000 on a 10X Cash ticket sold at Stop & Shop in Ansonia. Arthur Charles, of Ansonia; $10,000 on a 10X Cash ticket sold at Daily Mart in Ansonia. Steven Langan, of West Hartford; $30,000 on a Route 4 Quick Stop in Farmington. Joseph Van Quoc Tran, of West Hartford; $27,812 on a Play 4 ticket sold at Sams Food Store in West Hartford. Andrew Aiello, of Greenwich; $50,000 on a Powerball ticket sold at Greenwich BP. Carol Hogan, of Southbury; $10,000 on a Mega Millions ticket sold at Street Corner News. Catherine O’Connor, of Torrington; $10,000 on a 10X Cash ticket sold at North Main Shell in Torrington. Lisa Currytto, of Stamford; $25,000 on a Money ticket sold at Belltown Superette in Stamford. Matthew Denyko, of Bridgewater; $10,000 on a 10X Cash ticket sold at J&R Business Services in Bridgewater. Joseph Shortell, of Ansonia; $20,000 on a 20X Cash ticket sold at Fuel First in Ansonia. Samuel Jacobellis, of Danbury; $10,000 on a 10X Cash ticket sold at C-Town in Danbury. James McDonald, of Fairfield; $100,010 on a Cash 5 ticket sold at Opal Ventures Vii in Fairfield. Latrese Pringle, of New Haven; $20,000 on a 2X The Money ticket sold at Hamden Shell. Shanon Lilley, of Danbury; $20,000 on a 20X Cash ticket sold at Fast Freddie's Danbury in Danbury. Michael Twigg, of Shelton; $50,000 on a Powerball ticket sold at Global Montello Group in Trumbull. Erin Doherty, of Woodbury; $30,000 on a 30X Cash ticket sold at Watertown Gas Mart in Watertown. Rhonda Rand Hill, of Ridgefield; $10,000 on a Mega Millions ticket sold at Stop & Shop in Ridgefield. Robert Christian Jr., of Westport; $10,000 on a Mega Millions ticket sold at Cumberland Farms in Westport. Carole Hanson, of Ansonia; $10,000 on a 30X Cash ticket sold at Merrit Country Store in Westport. Gregg Scully, of Redding; $10,000 on a Mega Millions ticket sold at South Main Grocery & Deli in Norwalk. Angelo Rafala, of Middletown; $10,000 on a 30X Cash ticket sold at Stop & Go Food Mart in Middletown. Joseph Jokubaitis, of Watertown; $10,000 on a Mega Millions ticket sold at Grand Central Cafe in Wallingford. Nedim Mrvoljak, of Middletown; $150,000 on a Powerball ticket sold at Sunoco Plus in Middletown. Stephen Korik, of Ansonia; $100,000 on a $100,000 Cashword ticket sold at North Haven Shell in North Haven. Monika Keen, of Norwalk; $10,000 on a 10X Cash ticket sold at News Express in Fairfield. Krislyn Degnan, of Greenwich; $10,000 on a Mega Millions ticket sold at Alltown in Darien. David Kolaniak, of Shelton; $10,000 on a $100,000 Cashword ticket sold at Trumbull Food Mart in Trumbull. Sekou Koivogui, of New Haven; $17,708 on a Play 4 ticket sold at West Rock One Stop Food Mart in New Haven. Yinghua Zheng, of Brookfield; $10,000 on a 30X Cash ticket sold at Avallone Discount Wine & Spirit in Danbury.